This is not something I can see myself doing very often - icloud.com brings my poor G3 iMac to its knees and "unresponsive script" dialogs are the norm. But I'm wondering if people with faster PowerPC machines are getting "There was a problem loading the application" when they try using the Mail, Contact, etc. options after they log in. No problems with Firefox 4 on an Intel MacBookPro running 10.5. I've attached a screengrab of the error dialogs. 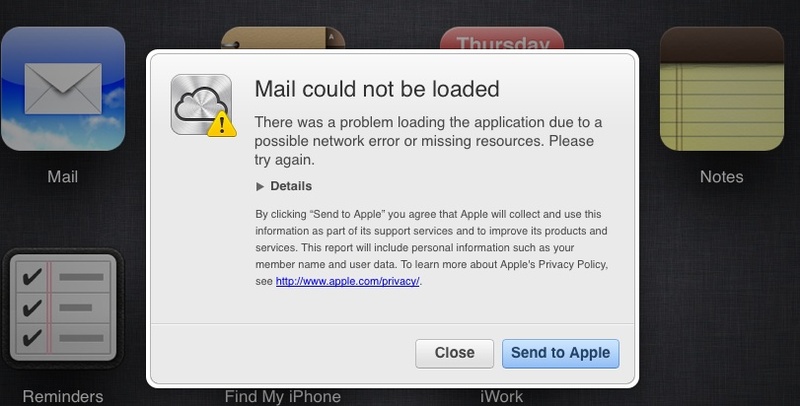 I don't use iCloud, so I can't say much about the problem loading the application. I'm pretty sure Apple doesn't use Flash or Java, so it's probably not a plugin problem. You might try TenFourFox 17, which will be out soon, maybe you have better luck with that. OK, I updated to 17 but it made no difference. However, I don't think this is a TFF/Firefox issue - I've just noticed that the same thing happens with the latest version of OmniWeb and also the last version of Safari for 10.4. Maybe it has something to do with the effort it's taking for the old G3 to try and communicate to the mail, calendar, etc. modules - too long and the site comes back with the generic error message. Unless someone is able to replicate the same problem on a fast G4/G5, I'll close this discussion in a few days. I don't know what a G4/G5 is but on my PC I am getting the cannot load applications error. I lost all my contacts the other day so when they were put back in from an old phone i was told to sync with my compter to save the contacts....but I can't get into icloud contacts to see what is there. Sharon, this site is specifically for support of the Power Mac browser TenFourFox. You might want to ask that question in Apple's support forums. nkhughes closed this discussion on 03 Dec, 2012 09:22 AM.